We love a casual, intimate celebration that truly reflects the personality of this couple, and this sweet is definitely that! 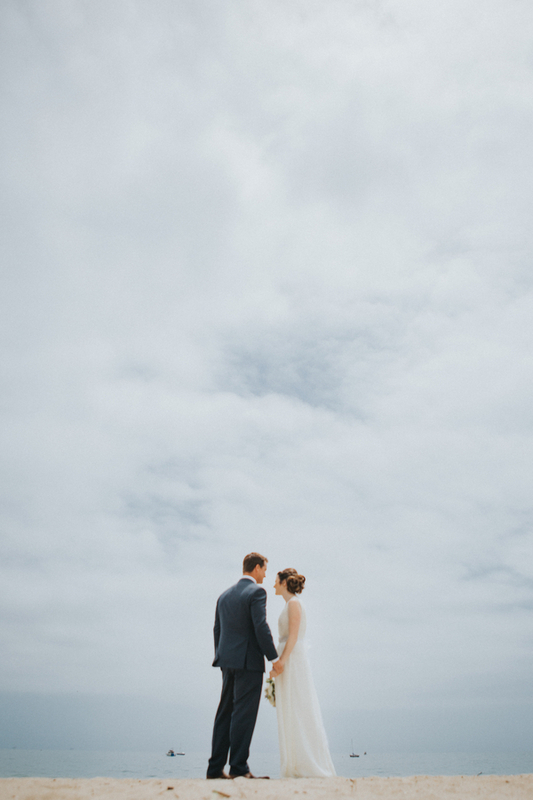 The couple chose to have an early first look so they could take photos in and around the many beautiful spots of Santa Barbara. Starting at first look at the beach, the couple then stopped at the amazing ruins of Knapp's Castle and then finally arriving at the wedding location, Cold Spring Tavern. The tavern which was built in the 1860's was once a stopover for those making the climb over the Santa Ynez mountains. Today, the location is a great location for an intimate, rustic wedding. For this couple, ceremony was held outside and decor was kept playful with oversized, graphic, flowers. Afterwards guests enjoyed dinner at tables decorated simply with bud vases filled with blush and white blooms. Mason jars filled with caramel corn served as favors. And a gold brushed cake with coordinating, graphic flowers, by CAKEgoodness was a hit with guests. All was photographed by Michael Stephens Photography.